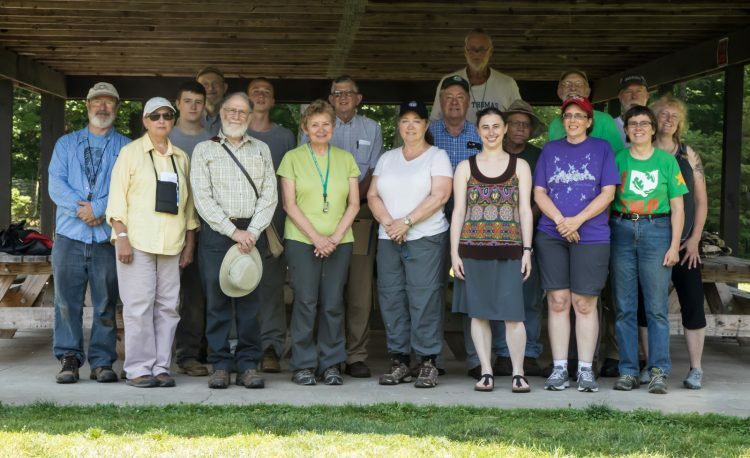 The 2017 OMLA Summer Foray was held on June 17 at Dawes Arboretum. Dawes is a nearly 2000-acre facility with an outstanding collection of woody plants from all over the world. The property also contains native woodlands and a pioneer cemetery dating from the early 1800’s. Moss and lichen habitat includes soil and tree bark. 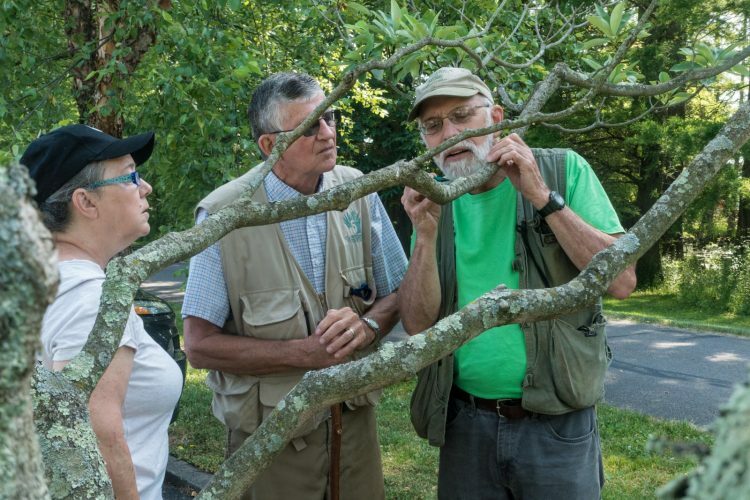 Julie, Ray and Bob examine corticolous lichens. There are a few glacial boulders on the surface but no bedrock outcrops. Lichens collected or observed included 59 species. Of these, 21 were crustose and 38 were macrolichens. Fourteen of the macrolichens were new county records. Two of these species deserve special note. The first Ohio record of Phaeophyscia insignis was for Adams County by James Lendemer in 2015 (see Crustose Lichen Workshop at the Edge of Appalachia, p.5, 2015 OBELISK). This collection at Dawes is only the second record for Ohio. Phaeophyscia orbicularis is a mainly western species that was recorded once from Ohio as a somewhat questionable record (see Wanted (Alive) Phaeophyscia orbicularis in Ohio, pp. 10-11, 2010 OBELISK). Don Flenniken searched for this species for several years without success. It was found earlier this year in Mahoning County by Tomás Curtis and was confirmed by Dr. Ted Esslinger. The Dawes collection was made from a headstone in the pioneer cemetery. The Beard Green Cemetery provides good substrate for lichens. 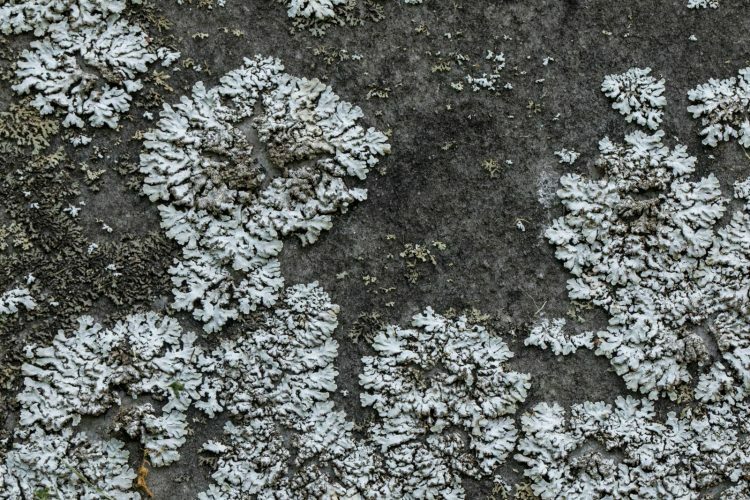 “Frosted lichen,” Physconia detersa, seen on on headstones at Beard Green Cemetery. 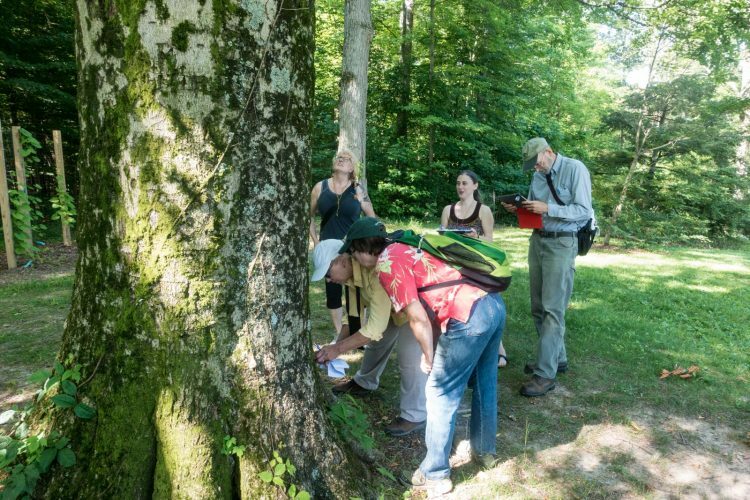 Prior to the foray to the Dawes Arboretum, 86 mosses and seven liverworts had been reported from Licking County. 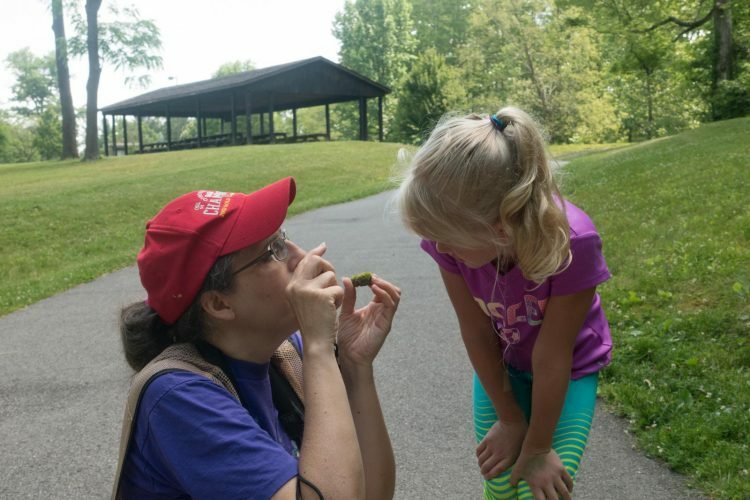 Carole shows a younger bryophyte enthusiast how to recognize a moss. While the Dawes Arboretum offered numerous trees as substrates, few boulders, and no rock outcrops were available for bryophytes. 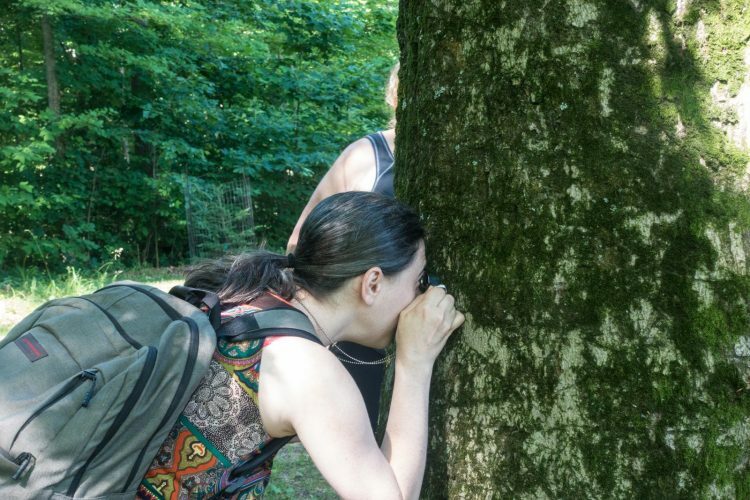 Julia scrutinizes bryophytes on a huge tree. In all, 41 moss species and three liverworts were collected. A large sycamore is substrate for many species.Of these, 15 mosses were newly reported for Licking County. The most significant was Trematodon longicollis, collected by Carole and Bill Schumacher (Schumacher 061717-08 (KE). 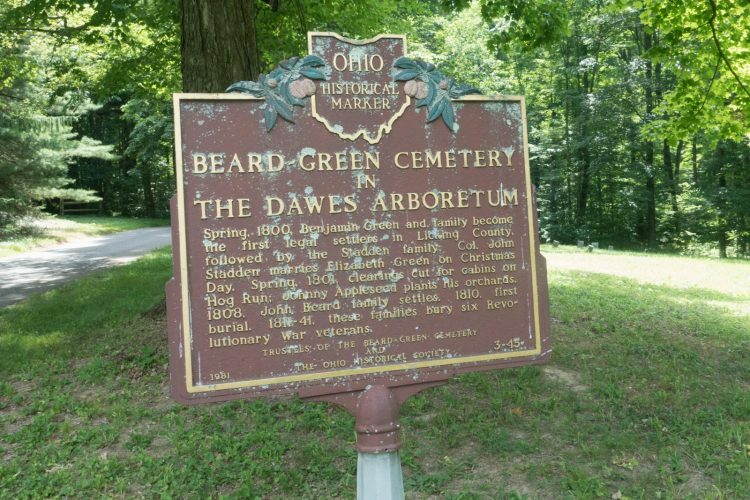 Previously known from four Ohio counties, it was collected during the OMLA foray to Brown County (Andreas 18919 (KE)) (OBELISK, Vol. 12, p. 7). 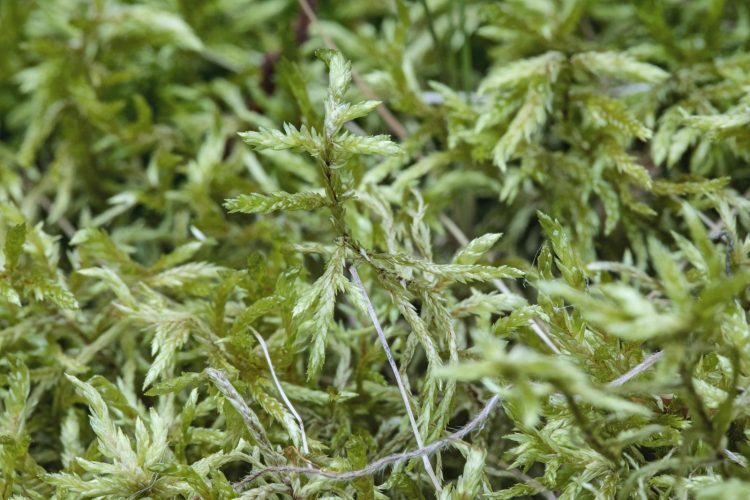 Pleurozium schreberi is a robust carpet moss found on thin soil in open areas. These records emphasize the need to preserve natural areas in Ohio and also to survey areas which have not been visited by lichen and moss experts. For further information about this most excellent foray, including moss and lichen species lists, look in the December 2017 volume of the Association’s newsletter, OBELISK.